Make a difference in the lives of animals with no additional cost to you, and without changing the way you already shop online, by using the links on this page. Every item you purchase for yourself or someone else helps another rescue animal - it doesn't even have to be pet-related! now that you give a little something to ALF each time!! If you're looking for items that ALF needs, please visit our Wish List. Looking for a fun cartoon shirt with an animal rescue message? $5 for every shirt, tank-top, sweatshirt, or hoodie sold will be donated to Animal Loving Friends! Click on the T-shirt above to browse. You'll find a "Crazy Cat Lady" design, "Which Part of Meow Don't You Understand? ", "Rescued Is My Favorite Breed", "Don't Shop; Adopt! ", and many others. You can even order your very own Animal Loving Friends shirt! Every page is already tracked to Animal Loving Friends; there are no codes to enter. All you have to do is browse, click and buy to help the animals of ALF. Visit our T-Shirt shop today! Earn money for ALF by shopping Petsmart.com from the banner on this page. PetSmart is the nation's largest pet supply retailer, offering over 12,000 competitively-priced products. You'll find the same prices, coupons, and special offers as you do when going directly to their site. But if you click through the banner on the ALF website, Petsmart will track the sales and pay us 8% commission! It's simple, there are no additional fees to you, and there's no limit to what you can earn for ALF. Start shopping for your pets now! In the meantime, please shop Petco from one of the iGive.com or AdoptAShelter links below. Earn 6% for Animal Loving Friends from Entirely Pets! 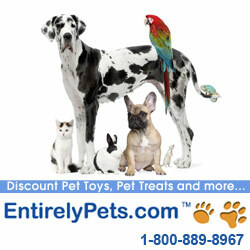 EntirelyPets offers a wide variety of pet supplies and medications for pets. They will pay ALF a commission on every order originating from this page, including prescription medicines! Shop for all your pet's needs from Entirely Pets. Up to 10% of your home stuff purchases goes back to help the animals of ALF! Wayfair is a zillion things home. Easy online access to the world's home stuff in one place. Wayfair carries over 5,000 brands of products across all major home categories like furniture, decor, kitchen and lighting, plus office, school, baby. And that's just the start. They also offer free shipping on most big stuff and most other stuff, too. Amazon.com will give up to 10% back to Animal Loving Friends! 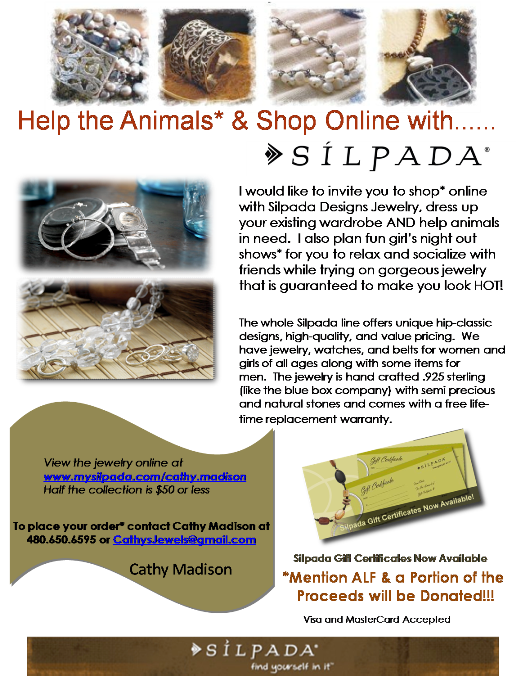 Click from this page to shop at Amazon.com, and a portion of your purchases will benefit the animals of ALF. Everything that you've come to expect from Amazon.com remains the same. There is no additional cost to you. Raise money for Animal Loving Friends every time you shop online at more than 1,000 of the web's best stores! Up to 26% of each purchase benefits ALF, at NO additional cost to you! You'll need to register and install a small button for your browser, that automatically makes sure every time you shop, you'll help. It's free to join, you'll get exclusive coupons, and for a limited time ALF will be awarded a $5 bonus for each new shopper! There are No pop ups, ads, toolbars, special search engine, or unwanted emails. Once you have the iGive button installed, any time you enter a participating online merchant site, your browser will tell the store that your want your shopping to support Animal Loving Friends. A small banner in the lower right corner lets you know that iGive is ON. Every time you shop using AdoptAShelter.com, you earn more money for Animal Loving Friends. More than 400 online merchants participate, some different from other portals, or with different percentages donated. But don't worry, just click one of the banners on this page, and enjoy shopping as you always have. Shopping through AdoptAShelter.com is exactly the same as going to the merchant directly - prices, customer service and discounts are all the same. Using the special links on this page simply allows a donation to be tracked to Animal Loving Friends. AdoptAShelter.com is FREE to you and free to us. There is NO catch. 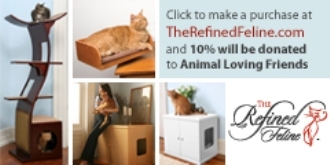 The Best in Modern Cat Furniture for YOUR Cats; Every Purchase Helps the ALF Cats! We are happy to announce a new partnership with The Refined Feline, makers of modern cat furniture. They design an assortment of high end cat towers, litter box cabinets, and cat beds both cats and cat owners will love. By clicking this link to visit TheRefinedFeline.com, 10% of purchases will go back to our organization! Honor the Bond Between Human and Pet With Animotions! This exciting artform is a wonderful way to honor the special bond between an animal and human, and makes an excellent, one-of-a-kind gift. 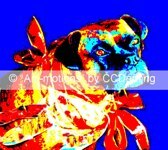 Starting with a photo of the animal, its emotions are expressed by light and color through the artist, and often the animal shares a message for its human. Order a custom "Ani-motion", and ALF will receive a portion of the proceeds. Orders can be placed at any time of the year, online or by phone, to benefit the animals of ALF. Important: You must provide the promotional code ALF in order to benefit the animals in our care.